If you own an Apple product you're no doubt an iTunes user. If you’ve ever used the search function to find binaural beats in iTunes then you've probably been overwhelmed by the amount of results returned, which probably left you wondering whether any of the 0.99 recordings are worth buying. It’s certainly cheap, and with albums of BBs available for under $9.99 it’s tempting. But, there is a price to pay, so to speak, and it’s not financial. Without wanting to cast aspersion on all the binaural beats recordings in the marketplace, the fact is, you aren’t likely to feel the full potential of binaural beats buying on iTunes, and here’s why. The frequency waves (binaural beats) track you hear underneath a recording relies on the frequency response process to effectively entrain the brain. When the track is converted to mp3 format it is imperative that the conversion is done in two ways: firstly, using a professional audio program that provides high quality conversion, and secondly, the recording must be mastered at between 192 and 320 kbps (kilobits per second). The reasons for this are simple. Low-grade mp3 convertors produce higher frequency loss, and a bitrate less than 160 -192 kbps to be on the safe side is too low and will produce further frequency loss. Well the effectiveness of binaural beats lay in the preservation of the binaural track. Its purity must be maintained and affected by EQ, coloured by other sounds laid on top of the track (binaural), nor decreased in quality through file compression. When a track is submitted to iTunes, it is usually done so via a service such as CD Baby; a service that submits tracks to digital retailers like iTunes and Amazon on behalf music labels. The master recording is supposed to uploaded as a .Wav or .Aiff file, which, in either format, is a high quality uncompressed version of the recording. However, many tracks are submitted in mp3 format at this important stage. This is done to save time, or because the recording has been passed from studio to the person responsible for uploading tracks via a computer. Because a .Wav file is time consuming to send and receive, an mp3 provides a quick solution. If a .wav or .aiff is submitted as should be the case, it is then encoded to mp3 and sent to the digital retailers, where it is encoded (compressed) again. If an mp3 is sent in to begin with, it will again be encoded (compressed) to the requirements of the digital distributor. So the creator compresses the track first, it is then compressed again by the digital distributor, and then compressed again by the digital retailer. That's a whole lot of compression! Which, unfortunately, potentially renders the binaural beats recording useless – because frequency levels and quality will have been lost in the process. But Don’t iTunes and Amazon Compress at 160 kbps+? Purchased songs are encoded using MPEG-4 Advanced Audio Coding (AAC) format, a high-quality format that rivals CD quality. Songs purchased and downloaded from the iTunes Store are AAC Protected files and have a bitrate of 128 kilobits per second (kbit/s). The purchased song should sound as good as or better than a 160 kbit/s MP3 file. Because the bit rate is lower, though, the AAC file takes less disk space than the MP3 file. As mentioned previously, 128 kbps isn’t recommended for binaural beats recordings, certainly not at Ennora anyway. But don’t get me wrong, this is fine for pop songs and such because 128 kbps is considered CD quality. Apple says the sound should be as good as 160 kbps. Fair enough. But here’s the thing. Looking back through the process described above; if an mp3 is compressed at say 128 kbps, and is then re-encoded at 160 kbps, and then again at 192 kbps, it makes no difference that the quality has been increased, because it hasn’t, the numbers mean nothing. Your next compression (encoding) is only as good as the master it came from. Effectively, what I am saying here is that there should only be one process of encoding where binaural beats recordings are concerned, and this should take place from a quality master at a high bitrate. Carrying on from the last sentence of the last section, the term “quality master” is also problematic where many of the recordings on iTunes and YouTube are concerned. There are a few open source programs available that allow amateur binaural beats producers to generate instant binaural tracks. Without wanting to mention names and harm the reputation of any program in particular, a few things should be noted regarding producing BB tracks using open source software. Firstly, the accuracy of the programs will not be that of professional studio programs such as Logic Audio. The free BB generators allow for limited manipulation of the track, and there are no (generally) tools available to test the accuracy of the purported frequencies. Professional programs require the programmer to build the binaural track from scratch, and offer greater scope for accuracy through the use of advanced EQ and EQ monitoring. So if you're wondering why the plethora of binaural beats recordings on YouTube don't make you feel the same way the tracks you purchased from a reputable BB retailer do, the answer is probably largely down to the majority of the tracks being bedroom produced using amateur binaural beats generator programs. Secondly, mastering a binaural beats track in a bedroom without proper acoustics will produce a substandard recording every time. All the biggest records are mixed down and mastered in an acoustically sound studio environment to ensure quality. Thirdly, making a binaural beats track using a free generator, and then mastering the final track using amateur audio software will not produce a quality final product. That’s not to say it won’t work, but it certainly won’t be as powerful, nor pleasurable to listen to, as it should be. It will lack warmth, quality and potency. Lastly, buying a highly compressed, amateur recording is really potluck. The recording won’t have gone through the necessary testing phase to prove its effectiveness before going to market. This testing is essential for one simple reason; if the recording doesn’t work it shouldn’t be sold. “Why might a recording not work”? I hear you ask. Well, occasionally the soundscape laid on top of the binaural beats track interferes with the frequency response process. This is usually picked up and avoided when creating the recording using frequency analysis, but on occasion it can be missed by an engineer, and doesn’t become apparent until the testing phase; at which point the track will be tweaked for perfection. 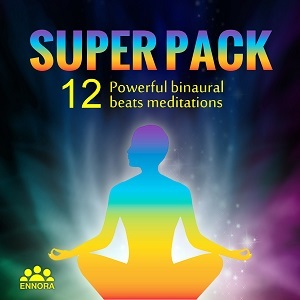 All Ennora binaural beats recordings are created in a professional studio environment using professional software by professional engineers, and mastered with minimal compression at 256 kbps. What Are Theta Binaural Beats and Why Should You Use Them?